IoT Provider Increases Location Services Accuracy 3X Using New Bluetooth 5.1 Direction Finding Feature - Silicon Laboratories Inc.
AUSTIN, Texas, Jan. 28, 2019 /PRNewswire/ -- Silicon Labs (NASDAQ: SLAB) releases new Bluetooth® software for the Wireless Gecko portfolio, the industry's most comprehensive connectivity solution for the Internet of Things (IoT). Silicon Labs' commercial, industrial and retail customers can enhance their location-based services, such as indoor navigation, asset tracking, space utilization and point-of-interest engagement, using the direction finding feature added to Bluetooth in version 5.1 of the Bluetooth Core Specification, which was released today. To help meet the growing demands of the location services market, Bluetooth has added a new direction finding feature, allowing devices to determine the direction of a Bluetooth signal. The new feature supports multiple methods for determining signal direction including angle-of-arrival (AoA) and angle-of-departure (AoD), and Silicon Labs' implementation of the new Bluetooth feature enables detection of signal direction within 5 degrees. To date, Bluetooth asset tracking and indoor positioning solutions have typically provided location accuracy within a range of 3-4 meters. With the Silicon Labs Bluetooth 5.1 solution, developers can create products that improve location accuracy down to the sub-1-meter level, opening the door to applications previously not possible. "The Silicon Labs Bluetooth direction finding solution provides a huge leap in location services accuracy for the industry," said Matt Johnson, Senior Vice President and General Manager of IoT products at Silicon Labs. "The combination of the Silicon Labs wireless solution and the new features added in Bluetooth 5.1 will help developers transform industries and improve people's lives." Silicon Labs' direction finding software, including support for the AoA method, is available today to selected customers through the Silicon LabsSimplicity Studio development kit. 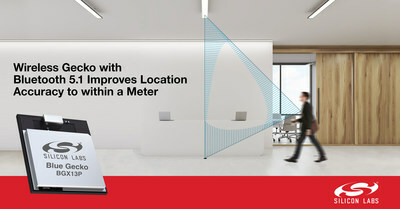 For more information, visit https://www.silabs.com/bluetooth-direction-finding.